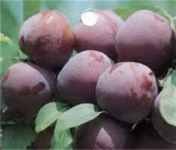 Prune plum with large oval purple fruits that ripen early. Good shipper. Huge heart shaped fruits have red flesh and dark red skin. An old favorite for size and taste. Large oval fruits have glossy black skin and amber flesh. Heavy producer that requires thinning. Self-fertile variety with yellow-green fruits with red specks. The rich, sweet flavor makes this the perfect dessert plum. Tends to be a biennial producer. Ripens mid-season. 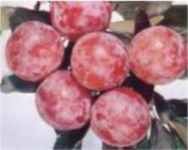 Large, round, uniform fruits with dark red to crimson skin and aromatic yellow flesh. Tree is large and productive. Oval dark red fruits - skin and flesh. Trees are very productive. Ripens mid-season. 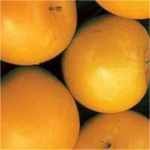 Gorgeous medium sized yellow plum - early ripening, sweet and juicy. Productive trees present a lovely show every season. This collection of Japanese and European varieties guarantees an extended season of fruit. Shrub or tree with white springtime blooms. Very hardy. Hardy to -40F (-40C); height: 50ft. Large shrub or multi-stemmed tree producing bracts of fragrant white springtime blooms. The fruit is edible, but not as tasty as that of its relatives, and has a dry flesh and thick skin. The fruit has been used to treat digestive problems, but caution should be used, since the seeds contain toxic properties (like all Prunus species). The plant makes an exellent screen or hedge, and grows quickly. Hardy to 10F (-17.7C); height: 40ft. 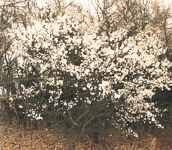 Considered a flowering variety as it is covered in fragrant white blooms in the spring, this variety also produces small fruit in the summer that is excellent for jams, preserves, and for wildlife. Drought resistant and adaptable. Hardy to -10F (-23.3C): height: 25ft.